Now there is a kids 2019 Year Of The Pig T-Shirt. This kids t-shirt is available in 20 different colors and all are made from 100% cotton and they come in kids sizes XSmall – XLarge (2 – 20). 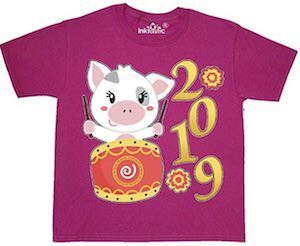 On the Chinese New Year t-shirt you can see a cute piggy and it is playing drums and next to the pig it says “2019” because that is the year of the pig. If you are a pig yourself like me then this is the shirt to wear all year long as it should bring you even more good luck. Now you just have to choose the fun color and size and you are ready to make the year of he pig a fun year for you. What do you get when you have a chicken, pig and cow? Tatsy tasty, yummy yummy food of course! 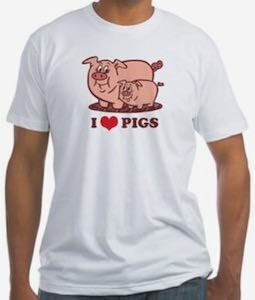 This is an all black t-shirt that features on the front a red silhouette of a chicken, pig and cow with the red block lettering underneath that says “ANIMALS TASTE GOOD”. It is available in a wide range of sizes that go from Small to 3XL and is made from 100% cotton giving you a durable t-shirt that will also be very comfortable making this a very appetizing shirt that can be great for any occasion. 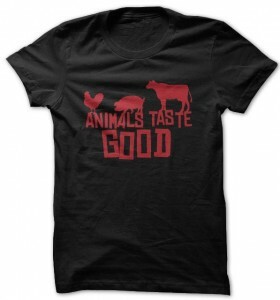 Have a closer look at this Animals Taste Good t-Shirt. This little piggy can go anywhere you do. Check out this t-shirt made by the cool company The Mountain, with a life like image of a very cute pig face on the front looking like it is popping out of your shirt with amazing attention to detail. Made from 100% cotton this t-shirt will be durable and also have a very nice snuggly soft feel, it can be found in many sizes and is easy care as it is machine washable. 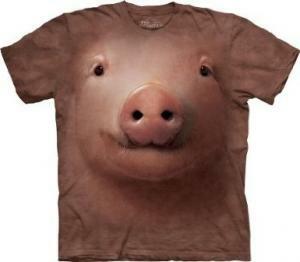 Try on your Cute Pig Face T-shirt. 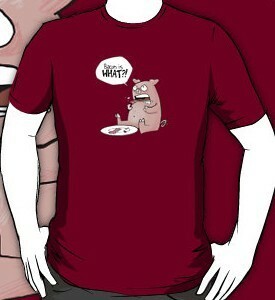 This is a classic shirt featuring a pig sitting down eating some bacon, but suddenly relizes what bacon actually is so the quote text above the pig says “Bacon is WHAT?!”. Made from 100% cotton there is so many styles and sizes of shirts to get this piggy printed on, there is also a wide variety of colors. Get your Bacon Is What?! T-Shirt. This women’s t-shirt looks amazing and that is all because of some funny birds. OK they are Angry Birds and those birds are hot and crazy. 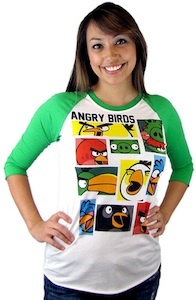 On this t-shirt you find all kind of squares with different pictures based on Angry Birds. And yes of course there is a Pig and Red Bird you know there is even Black Bird and tons of other Angry Birds characters. It is a fun and colourful shirt with slightly longer sleeves to keep your lady warm. Time to have a much closer look at this Angry Birds Topple T-Shirt. 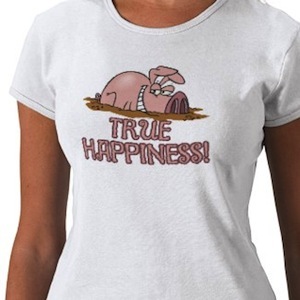 So if you are friends with a cute pig then this is the t-shirt for you. 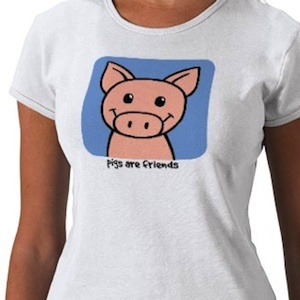 Check out this Pigs Are Friends T-Shirt.